PhD in Agricultural Entomology at University of Naples Federico II. Senior researcher at the Institute for Sustainable Plant Protection, CNR, Italy. He is dealing with subjects concerning the biological control and IPM of insect pests and the symbiotic relationships between insects and microorganisms. Main research topics are: integrative taxonomy, biosystematics and characterization of parasitoid wasps and insect pests; reproductive biology of parasitoid wasps; influence of endosymbiotic microorganisms on biology, ecology and evolution of their insect hosts; sustainable control of invasive pests. 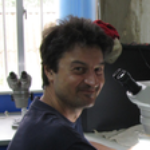 Recently, he has been is the coordinator of the project SYMBIOCONTROL “ The role of the bacterial symbiont Cardinium in shaping the ecology and evolution of an insect parasitoid wasp: fundamental studies and implications for biological control of plant pests”, EU FP7-PEOPLE-2012-IOF (PIOF-GA-2012-327525. Author of more than 20 papers on international journals.